It’s sort of astounding to me that of the five previous films featuring the single most well-known and well-loved superhero of all time only two are any good at all (only one of which can actually be called great). Superman is beloved by millions, yet only Richard Donner has ever been able to get the character right for film. I understand the difficulty of this, after all Superman is less about his own personal arc as he is about how he affects the people and the world around him. That’s not to say there’s not emotional depth that can be found in the character – there most certainly is – but his identity is fairly unchanging. In the wake of big blockbuster successes for more flawed characters like Batman, the X-Men, Iron Man, and even Spider-Man it’s become somewhat commonplace to dismiss Superman as a boring character; merely a “big blue boy scout” who doesn’t have any problems. That couldn’t be further from the truth. Superman is the ultimate outcast, he is one of the very last survivors of a world he barely knows and he is different on the most fundamental of levels from the inhabitants of the planet he has known for most of his life. He has the capacity for almost limitless power, yet he chooses to use that to protect the people of Earth and be a beacon of hope for those who may not always deserve it. Richard Donner’s original Superman got this, as did certain elements of Superman II, and it’s that core element that makes those two films (particularly the first) shine while all other Superman films have failed. And now, 35 years after Superman forever changed the comic book movie sub-genre and brought the definitive version of the Man of Steel to film, Zack Snyder is at the helm. Snyder is a polarizing filmmaker, to say the least, and while some people absolutely eat up his bold and distinct visual style, there’s others – myself included – who think he’s sort of a hack when it comes to telling coherent and meaningful stories. His films have always felt incredibly shallow to me, focusing on surface level “coolness” without really getting at any kind of resonance when it comes to story and characters. Sucker Punch is the worst offender in this area (as well as an utterly terrible film no matter how you slice it), but even his more popular films like 300 and Watchmen failed to make me care about what was happening on screen despite the gorgeous imagery. They were boring slogs that offered nothing beyond being “cool,” an utterly empty endeavor. When Snyder was brought on to direct Man of Steel my hopes sank because, in my estimation, he was one of the worst mainstream directors imaginable to take on a character who requires a strong emotional core to really work properly. This was further reinforced when Snyder’s descriptions of Superman for the new film primarily consisted of the words “cool” and “awesome.” Superman meets Sucker Punch was a film that I never wanted to see, and even though I think Chris Nolan is generally fantastic, his story sensibilities also felt wrong for Superman. Nolan’s role as producer didn’t do much to assuage my fear of a Snyder-directed Superman film. I desperately wanted to see a great Superman film again, one that was worthy of the character’s legacy, but I didn’t have much hope that Snyder could deliver on that. 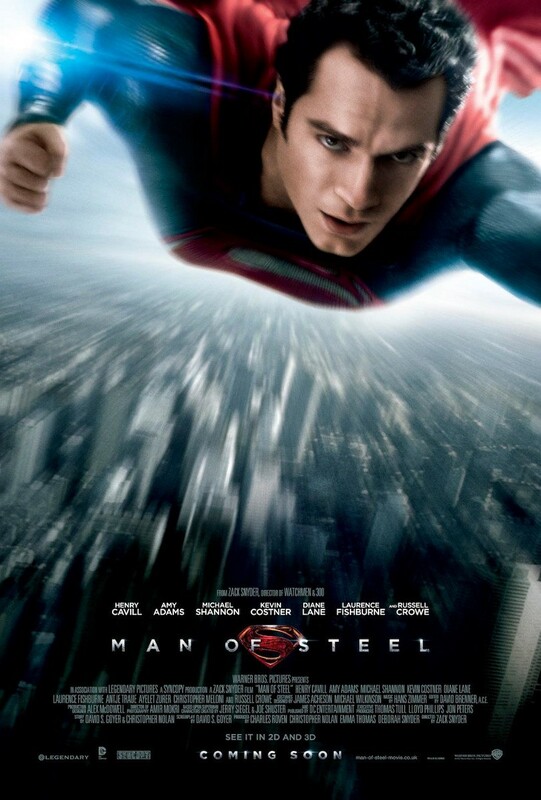 Then something funny happened; the third trailer for Man of Steel debuted and absolutely knocked my socks off. Those two-and-a-half minutes showed the Superman film I’ve always wanted to see. It combined fantastic imagery with gravitas, emotion, and spectacular action; if the movie was as good as this trailer we could finally have something that eclipses the Richard Donner film as the definitive Superman motion picture. In two-and-a-half minutes I went from just shy of pessimistic to genuinely excited for this new film. As it turns out, that only managed to make the actual film all the more disappointing. First, let’s start with the basics: Man of Steel is a clean start for Superman (unlike Superman Returns) and in several notable ways actively tries to distance itself from the Richard Donner film(s) all the while treading a fair amount of the same ground. We start out on Krypton with the birth of Kal-El and the eminent destruction of the planet, though in this version it’s made clear that Superman is special even amongst Kryptonians because he is birthed naturally rather than bred for a specific purpose through eugenics like most Krypton children are. At the same time, General Zod is leading a coup in an attempt to save the bloodlines he’s deemed worthy from the destruction of the planet. Jor-El rebels against Zod’s plan and instead sends his son, along with the “codex” (a MacGuffin containing the history and genetic information of their race, or something like that) off the dying planet. Zod and company get banished to the Phantom Zone, Krypton blows up, and baby Kal-El crash lands in the middle of Kansas. From there the classic origin story plays out mostly as it always has with a few changes thrown in for good measure; rather than front-load the film with young Clark in Smallville stuff, it’s interspersed throughout the film in flashbacks. The film also takes a slightly new approach to Jonathan Kent, having him encourage Clark to hide his powers for fear of the world rejecting him. As would happen, Zod manages to escape from the Phantom Zone and shows up at Earth where he threatens to destroy the planet unless Kal-El turns himself in. Man of Steel is one of the premier examples of a film that is absolutely less than the sum of its parts. A lot of things in this film work really well in isolation, of particular note are the aforementioned flashbacks. At first I was worried about rehashing Superman’s origin story *again,* but these turned out to be some of the strongest parts of the film. Snyder takes us through Clark’s childhood using a series of non-linear scenes that are beautiful both aesthetically and emotionally. We see Clark struggling with his developing abilities, struggling with the weight of having these incredible gifts that his father has told him he can’t use, and coming to terms with who he really is. This is all really great stuff, but unfortunately it exists in a vacuum, this level of emotional character-driven story telling doesn’t exist anywhere else in the film and these scenes do nothing to inform anything that happens in the rest of the movie. Even from a standpoint of pure character development they don’t really do much to affect who Clark is when he finally puts on the cape. They’re fantastic sequences taken in their own right, but in the context of the film they become a bit tedious and don’t carry any weight with the rest of the story. What’s interesting, though, is that these scenes do something that we’ve never seen in a Zack Snyder film before: use character and nuance rather than speed-ramping and guitar riffs to convey a story. It’s these scenes that make me feel somewhat compelled to eat my earlier words about him being a hack; maybe he’s not a lousy director, maybe he’s just been making the wrong kind of movies. Zack Snyder has always been praised for his visual style, and his skill in that regard is undeniable. His movies *look* fantastic, and in the case of Man of Steel an opening sequence on Krypton is one of the most visually inventive things I’ve seen in a movie theater this year, but when he’s aiming for these whiz-bang spectacle scenes he completely loses the story. In that same sequence there was about twelve different things happening and I couldn’t muster up the effort to care about any one of them; it was incredible to look at while being completely hollow and boring. Ironically, it seems that these smaller, quieter moments (relatively speaking; one of these “smaller” moments features a school bus driving into a river and another involves an approaching tornado) allow Snyder to not get so caught up in the superficial “coolness” of the thing and instead just focus on telling a story. Along those same lines, the last half of the movie simultaneously features some of the most spectacular superhero battles ever put to film while being an absolutely painful bore. Snyder desperately wants to be an action director, but he’s simply not good at directing action. Something that’s not often discussed, but hugely important to action films is the idea that action sequences in a film, like any other part of a movie, need to tell a story. Just like a song in a musical should have its own set-ups and pay-offs while informing part of the overall narrative, an action scene in a movie must have both its own internal coherence while benefitting the larger film. Consider the truck chase in Raiders of the Lost Ark, one of the absolute best action scenes of all time; every moment of that scene has a solid grounding in story telling. There’s the larger picture of Indiana Jones trying to reclaim the Ark of the Covenant from the Nazi forces, but there’s also smaller moments of self-contained story in that action scene. At one point, while Indy is trying to wrestle control of the truck away from a Nazi soldier they drive through a construction site and a worker falls onto the hood of the truck and looks at them through the windshield before jumping off. Indy and the Nazi share a quick laugh before Jones kicks him out of the truck. At another point two Nazi soldiers are shimmying along the side of the truck; Indy spots them in the mirrors and swerves the truck into trees on either side to knock them off. And then, of course, there’s the part when Indy gets thrown through the windshield and is forced the crawl along the underside of the truck to get back in. There’s variety throughout this scene and it’s these micro-stories contained within the larger action sequence that helps to keep it interesting and engaging. If the same thing is happening over and over it becomes tiresome and unmemorable. That’s exactly the trap that Man of Steel falls into with its big action set pieces. On a technical level the end battle is stunning. It’s exactly the type of massive superhero battle that comic book fans have dreamed would one day be up on the silver screen. Two Kryptonians battling it out using the full extent of their powers. On a purely visual level it’s very well executed. However, after a solid hour of people flying through the air and punching each other it gets rather boring. There’s no coherence to it and there’s not a lot of variety either, it’s not exciting, it’s not engaging, it’s just things happening. Snyder simply does not know how to tell a story through action. He does a wonderful job making it look incredible, but it’s all completely hollow. On a semi-related note, it’s fairly bothersome how little Superman seems to care about the destruction that happens as a direct and indirect result of his actions. As I mentioned, the scale of this final battle is huge and it takes place right in the center of Metropolis during the middle of the day. If we’re being conservative probably tens of thousands of (fictional) people died, and it doesn’t really seem to phase Superman all that much. This feels completely wrong. Superman is supposed to be the ultimate hero, the absolute ideal. He’s supposed to have near-limitless power and use that to protect even the most lowly of people, yet here a large portion of a city gets decimated and there’s no indication that he has any care for the thousands of lives that have been lost. That’s one of the things that was so great about The Avengers: while it had the large scale battle in the middle of New York city, Joss Whedon made a point of showing the heroes being heroic; going out of their way to save civilians rather than just letting thousands of implied deaths occur without a second thought. There’s also another fairly substantial issue I have with this part of the movie, but I won’t discuss it here because it technically counts as a spoiler (hit me up on Twitter if you’re curious). The overall tone of the movie is also problematic. Superman has always represented hope and optimism, but the tone of this film is largely gloomy and dour. A lot of people have expressed concern over the “Nolanization” of Superman, and I’d like to say here and now that that is absolutely not an issue. Snyder never tries to ground Superman in every day reality like Nolan did with Batman, and he actively embraces the stranger science fiction aspects of the character. What he doesn’t embrace, however, is the character’s heart. Superman never embodies “Truth, Justice, and the American way,” there’s no joy or hope or levity to the film, Superman has a sad face for most of the movie. Richard Donner’s Superman, of course, showed how to do the character right, but more recently Captain America: The First Avenger featured the kind of tone that a Superman movie needs but was tragically absent from this. Cap and Superman are both fairly similar characters; while Superman’s powers are certainly more extensive, both characters are absolutely noble to their very cores. They both have strong moral centers and they both represent similar ideals, but while Cap’s movie was fun and hopeful and vibrant, Kal-El got a film that was dark and gloomy, something that is diametrically opposed to what Superman represents. Aside from those larger issues, there are a few other examples of elements of the film that are good in isolation, but fail in the context of the larger movie. One of these is the acting. There’s a pretty great cast assembled for the film, but the real standouts are Kevin Costner and Russell Crowe as Superman’s dual fathers. Costner has a wonderful warmth to him and brings a lot of emotion to his scenes while Crowe has all the gravitas that is required for Jor-El. As for the rest of the cast, Michael Shannon does a great job bringing both scenery-chewing insanity and genuine motive to General Zod, Amy Adams is excellent as Lois Lane and is easily the most engaged version of the character across all six of the films, and Henry Cavil is fairly strong as Kal-El, though a bit too mopey for my tastes when he actually decides to step up and be Superman. The funny thing is, while I thought both Cavil and Adams were great in their respective parts, together they didn’t have an ounce of chemistry. This is sort of a perfect microcosm of the problems with this movie: both actors are great on their own, but together they just don’t work. On another note, Hans Zimmer’s score is often quite beautiful, but it will be forever doomed to live in the shadow of John William’s absolutely iconic original theme. The Main Title March from Superman is so strongly associated with that character and nothing in Zimmer’s score comes close to being as absolutely representative of Superman. I still think it was a mistake to not use that theme at least in some small way; after all James Bond’s theme has followed the character over his many different incarnations and has worked just fine, why couldn’t the same be true of Superman? I really, really wanted to like this movie. I’ve had my fingers crossed for so long that I’m having trouble typing this, yet in the end it was a let down. It’s not an absolute failure because as I’ve said over and over, a lot of elements of this film are great in their own right, but when it came to combining them into the whole of the film it’s utterly broken. Superman is the most beloved superhero of all time, and here, 35 years later, we’re still waiting for a movie that’s even half as good as Donner’s Superman. Man of Steel has the action that fans have been craving, but without the heart of the characters and without a strong storyteller it all falls flat. Superhero films are the biggest genre in Hollywood right now, but the biggest superhero of them all, the one who should be getting the most extensive star treatment, gets stuck with a movie that doesn’t understand who he is and a director who can’t tell stories through action. That is the sad state of Superman right now, I desperately hope one day that will change, but sadly it hasn’t changed yet. Over the next few years who knows what will happen in regards to a sequel to this film or the proposed Justice League film, but at this point all I really want is for Superman to be meaningful again. Really, that can’t be too large a request, can it?